Crunchy Cabbage Carrot Apple Medley combines amazing flavors and textures together. This is an easy dish to make with tastes beyond simple. This delicious recipe was updated 2/19/2019 to improve the reader experience. 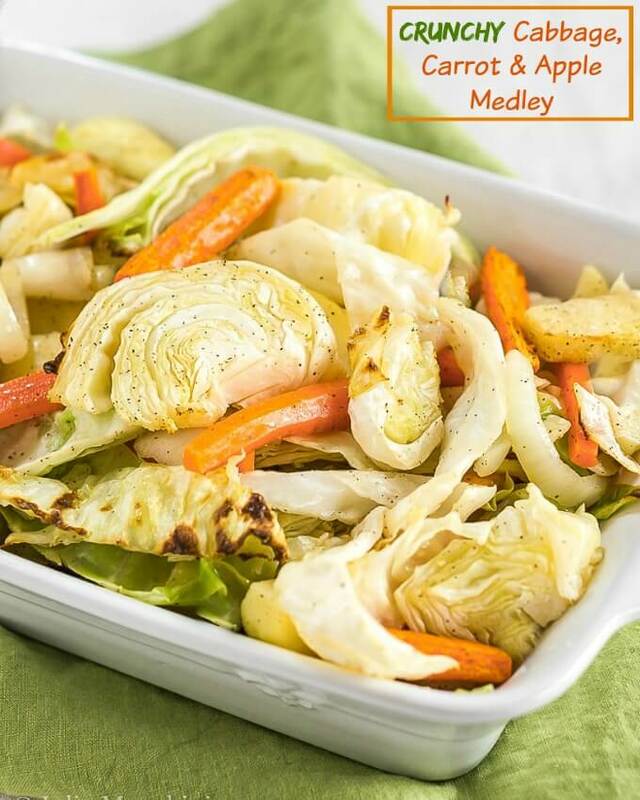 Crunchy Cabbage Carrot Apple Medley is a combination of roasted vegetables. The flavors are sweetened from roasting and combine together beautifully. Best of all it’s simple to make and easy to clean up! I think a lot of people don’t use much cabbage in their dishes except when they are making one of my favorite meals, Corned Beef and Cabbage. Cabbage is one of those ingredients that John always insisted that he didn’t like. What I’ve learned is that John doesn’t like over-cooked mushy or tasteless veggies. Some recipes for cooking cabbage require you to bake or boil cabbage almost as long as you do a corned beef brisket. No wonder he thought he didn’t like it. This dish was more of an idea than a recipe. I clipped out an article in our local paper in January regarding cooking cabbage. It had a whole list of spices and ingredients that looked pretty darned good. I knew that I had all of the ingredients, but the persistent question of why kept nagging me. I love simple flavors with simple ingredients. With this dish, I roasted the veggies together until they just began to soften. 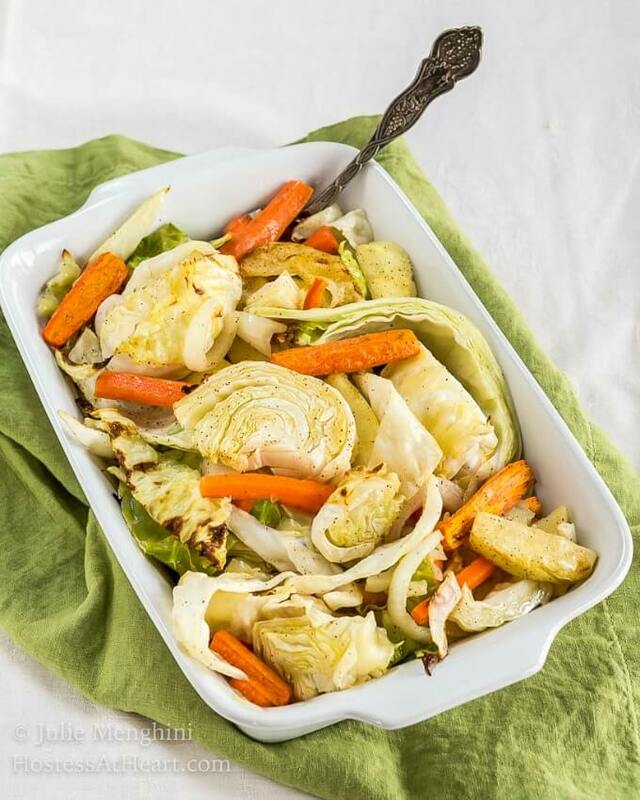 The high heat coaxed out the flavors of the cabbage, carrots, onions, and apple. Using a simple drizzle of EVOO and a little S&P and you have one beautiful dish. I used to drown my cabbage in melted butter. Was it good? Sure it was, but I didn’t miss all of that extra fat in this simple cabbage recipe. Cabbage is actually good for you if you don’t drown it in butter. There are only 33 calories in a cup of cooked cabbage, and it is low in fat and high in fiber. What ingredients are good with Cabbage? Don’t forget to save this recipe to your favorite Pinterest board for easy reference! Bacon or corned beef would be delicious in this dish too. I would recommend adding pre-cooked meat at the end. You don’t want your vegetables to become greasy or your meat to overcook. This recipe is all about a fresh dish of perfectly cooked ingredients. Cut all of the ingredients in similar size so they cook at the same rate. 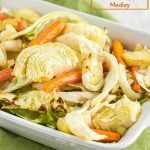 This easy cabbage recipe can be served as delicious vegetarian cabbage recipe or side dish too. Tools to make your life easier! Vegetable Peeler – my kitchen couldn’t exist without a vegetable peeler. I didn’t know what I was missing until I replaced my old one for a nice new sharp one! Shun 8″ Chef knife – This knife isn’t cheap. However, I’ve used the same knife for almost 10 years and purchased them as gifts. It fits perfectly in my hand and sharpens beautifully. It’s an investment worth making. Here is a little more cabbage inspiration! Crunchy Cabbage Carrot Apple Medley is an easy recipe that combines amazing ingredients and simple techniques. The flavors and textures of this dish are beyond simple. Preheat oven to 400°F. Line a rimmed baking sheet with aluminum foil. Peel carrots and chop into thick pieces. In a large bowl Combine cabbage, carrots, apples, and onion. Drizzle with olive oil. Sprinkle with salt and pepper. Spread out on the rimmed baking sheet. Bake 20 minutes, turning halfway through or until vegetables are lightly browned and beginning to soften. I’ll be making this baked cabbage recipe a lot more instead of just saving it for St. Patricks Day. My daughter said this is the only way she’ll ever eat cabbage too! 1 I love cabbage and it’s so healthy when cooked or made right! The apple sounds so good in this! We really liked this Mollie. It’s going to be my new go too cooking method for cabbage. What a delicious and healthy side dish. I can imagine what lovely flavors and sweetness roasting brings out of the veggies and apples. Simple and tasty – my kind of recipe! Thank you Lily! It was a great change and I think it’s our new favorite way to enjoy cabbage. What a delicious combination. And it looks good. Thank you Jeff! I loved this dish and even ate it for lunch. Looks delicious Julie!! Happy St Patricks Day!! Thank you Suzanne! Have a wonderful weekend. Thank you, Jenny! I don’t know why it took me so long to cook it this way but there’s no turning back now. I hope you have a great weekend. I think the only time all year I eat cabbage is on St. Patrick’s Day and I always think I should eat more of it. I love the addition of apples. This sounds absolutely delicious! Happy St. Patrick’s Day, Julie! Thank you so much, Kelsie. Like you I don’t know why we don’t eat it more often. It’s so easy I need to change me ways LOL! Have a wonderful weekend.